I give this rather lengthy introduction not to be academic nor facetious. From adherence to the 180˚ camera placement rule, to the naming of shots, to even referring to drawings as shots and choices of framing as camera placement, movie rules and jargon have taken over comic book thought recently. We need to recognize comic book creation as an art form unique unto itself and not cotton to the rules of others just because their art form is more respected and universally admired. 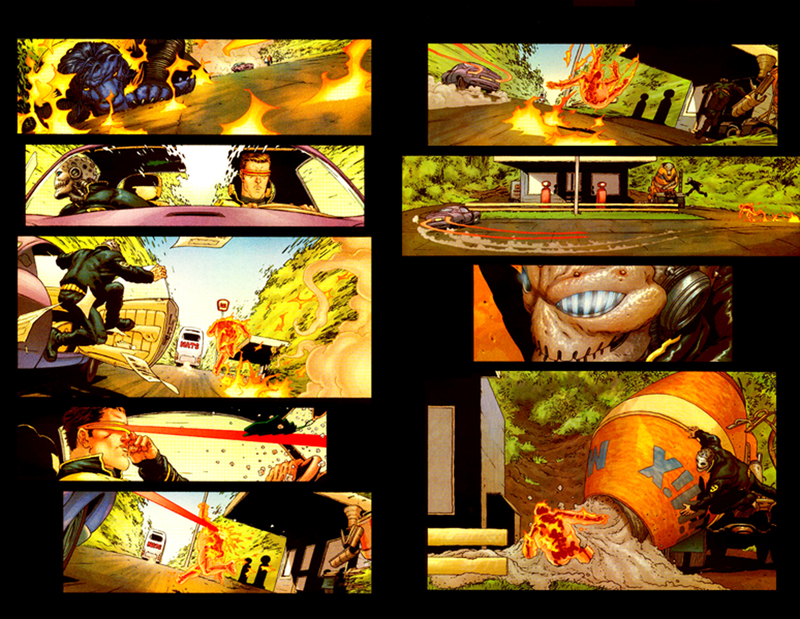 However…some young artists have become very, very good at aping that widescreen movie approach to action scenes. 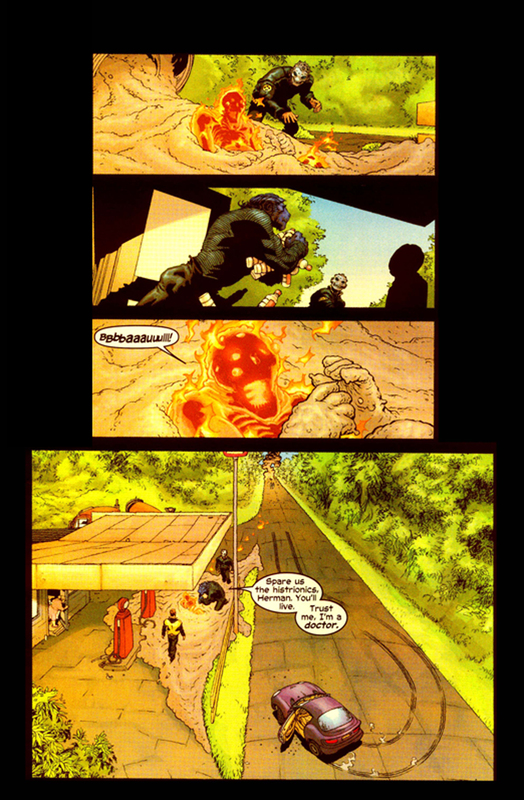 Bryan Hitch’s unbelievable work on The Ultimates immediately springs to mind. 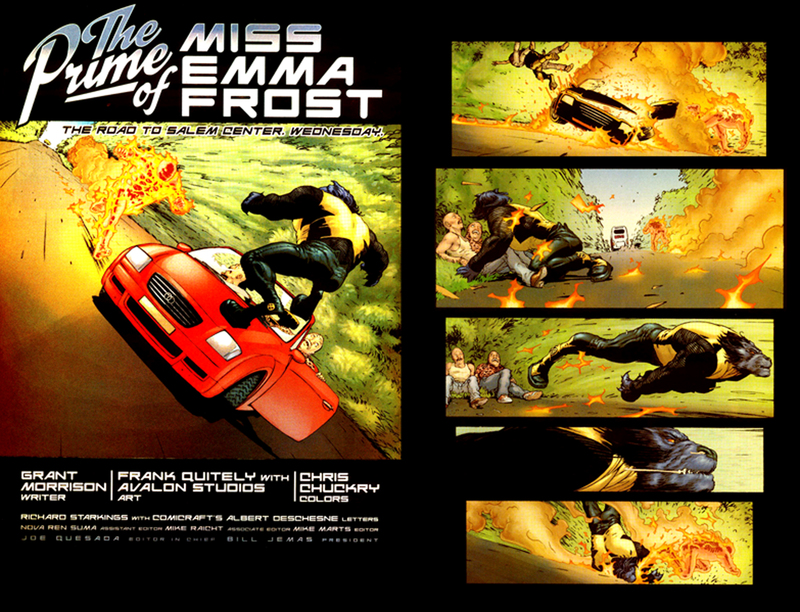 Frank Quitely blows us out of our comfy theater seats below. Are you kidding me!?! That chase was more coherent than anything in any of the Bourne movies! I just spilled my popcorn all over my lap. Do you mean to tell me none of that was moving? Ah, more than that my friend. Look again. I mean to tell you Quitely just pulled all that action off without a single motion blur or speedline. For serious. Quitely brilliantly indicates motion through items diegetic to the scene: the trail of Beast’s spit suggests his vector, the reflection of the trees and sky in the windshield give us the car’s speed, the taillight trails show the rapidity of its turn, the shattering glass the force of Cyclops’ blast, the skid-marked road indicate the screeching halt that ended the scene. I do not mean to tell you, however, that he accomplished all that movement by somehow simply stacking widescreen rectangles. It is true that Quitely only employed one panel per horizontal tier, but once again, look again. Observe what is happening to the width of those rectangles. Quitely is expertly varying the size of his margin like an accordion, contracting and expanding space to shift the eye even in seeming stasis. This makes movement where there is none, giving the pages the feel of a choreographed dance. He at last pauses this with a large nearly square panel after a stack of equal-sized rectangles which slams the brakes and brings our read to a halt.